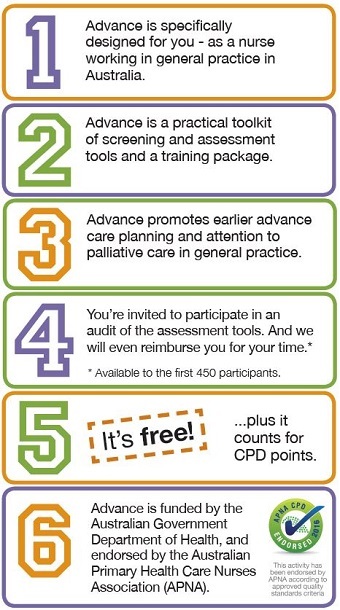 The Advance training package will help general practice nurses to work with GPs to initiate ACP and, where appropriate, palliative care for elderly and/or chronically ill patients within the practice. The online component of the training package will take about two hours in total to complete. The free practical workshops will be held on weekday evenings in every capital city of Australia for approximately 3 hours. Scholarships will be made available for GPNs from rural/remote settings to assist with their costs to attend the workshops.